Property Location With a stay at Pousada São Jorge in Bonito, you'll be minutes from Bonito Central Square and Jiboia Project. This pousada is within close proximity of Rio Sucuri and Bonito Convention Center. Rooms Make yourself at home in one of the 15 air-conditioned guestrooms. Complimentary wireless Internet access is available to keep you connected. Bathrooms with showers are provided. 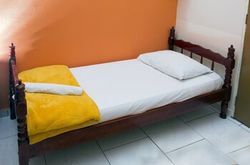 Conveniences include blackout drapes/curtains, housekeeping is provided on a limited basis, and rollaway/extra beds (surcharge) can be requested. Amenities Enjoy recreation amenities such as a fitness center or take in the view from a garden. Additional amenities at this pousada include complimentary wireless Internet access, tour/ticket assistance, and barbecue grills. Dining A complimentary buffet breakfast is served daily. Business, Other Amenities Featured amenities include dry cleaning/laundry services, multilingual staff, and luggage storage. A roundtrip airport shuttle is provided for a surcharge (available 24 hours), and free self parking is available onsite. Know Before You Go * Parents or a legal guardian traveling with children under 18 years must present the child's birth certificate and an identity card with photo (passport, for example) at the check-in. For international travels from Brazil, if just one of the parents is traveling with the child, she/he must present – in addition to the child's certificate of birth and identity card with photo – a letter authorizing the trip signed by the other parent with a notarial certification of signature. In case the parents or the legal guardian, as applicable, cannot or are unwilling to give this authorization, a judicial authorization is required. People who intend to travel to Brazil with children must consult with the Brazilian consulate before traveling for more information. * One child 3 years old or younger stays free when occupying the parent or guardian's room, using existing bedding. * Only registered guests are allowed in the guestrooms. Fees The following fees and deposits are charged by the property at time of service, check-in, or check-out. * Airport shuttle fee: BRL 25 per person (one-way) * Rollaway bed fee: BRL 50.00 per night The above list may not be comprehensive. Fees and deposits may not include tax and are subject to change. Nos fuimos de viaje a Bonito donde estuvimos parando en Pousada São Jorge. La atención fue muy buena. Realmente recomendable.